If you have a low power or stereo microscope, here are a few fun ideas of items to view with children. Get a $5 bill and look at the back. Just above the pillars on the Lincoln Memorial you should see the names of some states. How many can you read? Take a $1 bill and see what other interesting items you can find on it with the microscope. Coins and stamps are other fun items to view. Samples of fabric can be fun to compare. A plain weave looks like a simple cross pattern, while a twill weave (try blue jeans) or a pile weave (corduroy) will look different. Sand samples from different beaches or a river bed. Try viewing them with bottom illumination, then put the sand on a black piece of paper and view it with only the top illumination. If you leave a small pan of water outside in the summer, you may end up with mosquitoes laying eggs in it. Once the eggs hatch, look closely for tiny wigglers - these are mosquito larvae. You can collect one and put it on a depression slide to view under the microscope. Look for some other small insects - you might find a dead spider in a window frame, or an ant outside in the yard. Caterpillars are also great fun to watch under the microscope! When you are done - put your insects back outside so they can live in nature. Take a color page from a magazine - can you see the dots of different colored ink that make up the photo? You can also try this with a newspaper. Look at the center of a flower. Can you locate the stamen and the pollen? 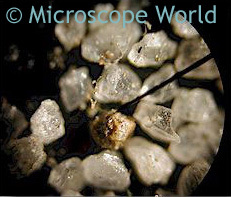 Interesting rocks, especially those with multiple colors in them are fascinating to view under the microscope. Use your imagination! Just about anything you find around your house might be interesting to view under you microscope. If you find some interesting items you may want to take them to school to share with your science class.